The Research-Based Teaching Series (RBTS) had its final workshop for the 2016-2017 academic year. Co-sponsored by the Department of English and the Center for Teaching, Learning, and Leadership (CTLL), RBTS seeks to support the work of faculty from all disciplines, colleges, and campuses by offering faculty presentations and workshops on best practices in teaching and learning. 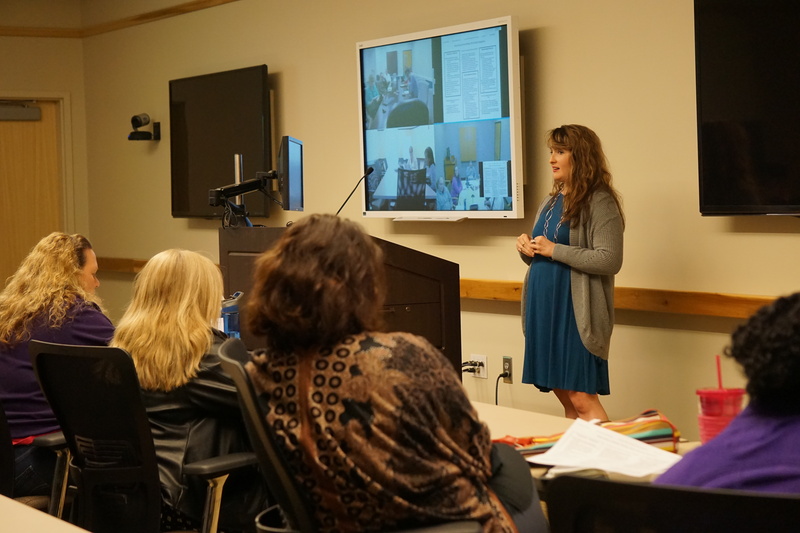 These workshops not only provide information and resources for faculty seeking to enhance their own pedagogical practices, but also give faculty an opportunity to present their work to peers. Principles of Excellence and Essential Learning Outcomes, which provide a broad foundation of ideals for a 21st century education across all disciplines, including sciences, humanities, professions, etc. The 2016-2017 RBTS programming included five workshops offered to all campuses. The 2017-2018 Call for Proposals is now available. Applicants can submit their proposal here. Kristin Kelly, Associate Professor of English, discussed “Talking Service,” a national reading and discussion program for servicemen and servicewomen coming back to civilian life from the war zone. Gina Reed, Professor of Math, led this workshop designed to support the research of all faculty and provided important methods and tools for conducting quantitative research in the classroom. This research can, potentially, develop into publishable scholarship in the areas of teaching and learning. Jim Shimkus, Assistant Professor of English and Director of Faculty Fellows, and Anita Turlington, Associate Professor of English, explained the relevance of the three constructs (and associated practices/activities) that engage students in learning beyond a simple quantity of writing (i.e. number of pages written) as high-impact teaching practices that help to enhance student learning and development. Their presentation used results from a recent research project, “The Contributions of Writing to Learning and Development: Results from a Large-Scale Multi-institutional Study” which identified the three constructs as Interactive Writing Processes, Meaning-Making Writing Tasks, and Clear Writing Expectations. These practices are helpful not only for those college teachers who are focused on teaching writing, but teachers in any discipline who are interested in strategies to enhance student learning. Molly Daniel, Assistant Professor of Rhetoric and Composition, presenting at the Effectively Responding to Student Writing workshop. Matthew Boedy and Molly Daniel, Assistant Professors of English, shared principles for giving effective feedback. These principles are grounded in composition theory but also includes particular strategies, practices, and “marks” by instructors. Many in the English Department teach First Year Composition on a regular basis, but faculty in other departments also teach writing-intensive courses. Much research in composition theory has been devoted to developing best practices for giving feedback to students in these types of courses. March 27, 2017 – Is Blended Learning a Viable Option? Jennifer Schneider, Assistant Professor of Accounting, addressed how to use an interactive approach to reach students. Educators and students are interested in positive learning experiences. Making the change to a blended learning structure might achieve the goal for both groups. “Flipping the Classroom” is a blended learning method that is being used to disrupt the passive learning pedagogy.